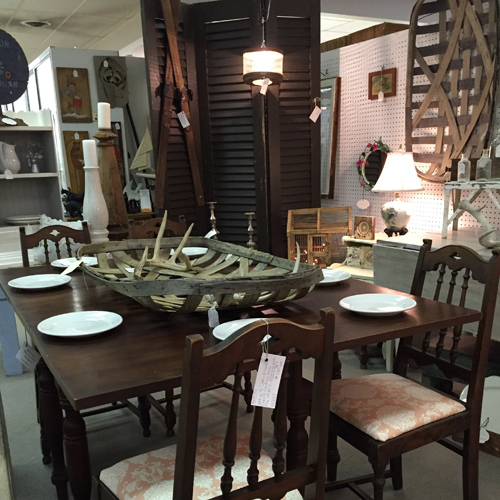 We offer Early American & Country furniture, architectural salvage items, garden artifacts, and vintage décor pieces. When my husband first visited my home, he remarked that my style was part farm house and part feed store with a dash of hardware store thrown in. That pretty much describes my passion for the “practical” past. My space at Warson Woods Antiques is primarily sourced from old farm sales in our area–and reflects the reuse, repurpose and reimagine spirit of our ancestors. Stop in to American Home & Farm and see what new OLD farm fresh things we’ve discovered for your home!